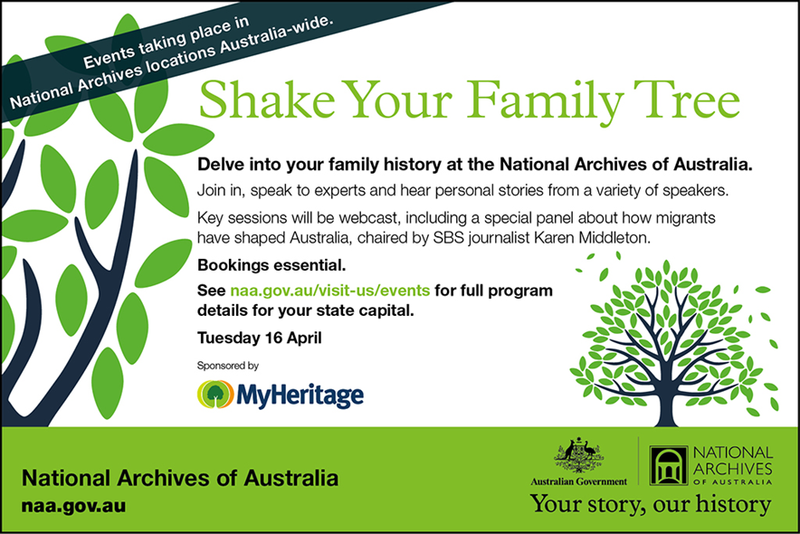 Delve into your family history with a full day of activities presented by the National Archives and their state and territory partners on Tuesday 16 April 2013. Speak to experts, and hear personal stories from guest speakers. This year’s Shake Your Family Tree focuses on immigration and the stories of the Australians that are descendants of migrants. Learn how to find records relating to your family’s story of arriving and settling in Australia. And don’t worry, if you can’t make it to one of the events across the country, then some sessions will be webcast, including a special panel about how migrants have shaped Australia, moderated by Karen Middleton, SBS journalist. Events are being held in participating state offices. See individual programs for details and times below. Bookings are essential, as the events are free and are sure to be busy. Click here to book online for the Canberra event. Bookings for all other states please refer to the programs linked to below. As mentioned above, on Tuesday 16 April some of the key sessions will be web cast and you can watch them online via the National Archives of Australia website either live, or catch up on them after the event. National Archives presents a practical introduction to its new website, Destination Australia. Discover photographs of your post-war migrant ancestors in the Archives’ collection, and share your stories. Record Matching, a new technology created by MyHeritage, is designed to automatically find historical records for your family trees from its growing collection of billions of records. Find out more with MyHeritage. A special panel session chaired by Karen Middleton, SBS journalist, sharing panel members’ experiences of making a new life. Discover your family’s migration records held by the National Archives, with Stewart Crawford.